When browsing through today's featured shop, DreamON, be sure to click on gallery (you will find this on the right under the shop announcements ~ to go back, simply click on list), so that all the dreamy prints can be viewed at their best. Ok, isn't this little fellow just adorable??!?! This wonderful original collage is of a Key West rooster scratchin' out a livin' in the lighthouse grounds. Less apparent in this collage, the lighthouse is a recurring theme in some of the paintings in DreamON. 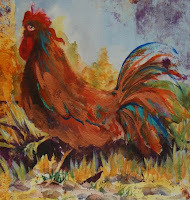 I just love the bright turquoise and red tail feathers in this rooster, and the proud head turned slightly away! What a stunning addition to any rooster collection! "I value the presence of a recognizable subject in my paintings. I love it when the center of interest appears in the midst of background objects that aren’t so well-defined. I want watercolor to look like watercolor, and I want my paintings to have a painterly look, not a photographic copy. Therefore I am an impressionist, because I don’t want to over-control the media." Here are a few more of my favourites from DreamON. I'm really a flower person. If you haven't been able to tell by the few notebooks in my shop and my favourites, you would know by looking at the art on my walls at home. Everywhere you look, in my kitchen, living room and bedroom, is flowers. I even have a poinsettia already. The best thing about flowers is the bright colours. That's what I love about this landscape bougainvillea on a rampage. The shocking pink flowers in this beautiful watercolour painting are growing up and over the misty white house, and coming after the surrounding jungle! These amazing purple flowers have also captured my heart. Flowers of vail appear to be deep plum petunias, bursting with colour and surrounded by lush green vegetation. 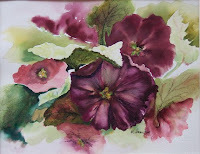 This watercolour and ink painting would be a magnificent addition to any home. I have definitely added it to my favourites! Alright, moving away from the flowers, but sticking with bright colours, these Egmont flamingos are sure to bring a smile to your face! Just look how casual these two look, wading around in the sea. This print would make a lovely gift for any occasion, and bring memories of warmer places when the weather here isn't quite so hot. 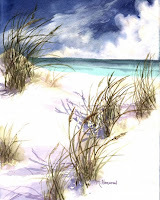 In fact, the cold wind and snowy-looking dunes in this card reminds me of the icier November weather. These Gulf Shore notecards don't look that bleak ~ though windy, the water beyond looks very inviting! These are definitely the perfect notecards to bring on vacation, and fill with stories of fish caught, water swam and beaches conquered. DreamON is definitely a shop you want to mark as favourite, and look back on when you're looking for that perfect print or gift. Don't forget to check out her blog too! Thank you, Amanda for the lovely article. Most flattering and appreciated very much!